The seventy-third United States Congress was a meeting of the legislative branch of the United States federal government, composed of the United States Senate and the United States House of Representatives. It met in Washington, D.C. from March 4, 1933, to January 3, 1935, during the first two years of Franklin D. Roosevelt's presidency. Because of the newly ratified 20th Amendment, the duration of this Congress, along with the term of office of those elected to it, was shortened by the interval between January 3 and March 4, 1935 (61 days). The apportionment of seats in the House of Representatives was based on the Fifteenth Census of the United States in 1930. Both chambers had a Democratic majority. August 19, 1934: House Speaker Henry Thomas Rainey died of a heart attack. The House had already completed its work for this Congress and had already adjourned. No Speaker was elected until the next Congress. March 9, 1933: The Emergency Banking Act (ch. 1, 48 Stat. 1) was enacted within four hours of its introduction. It was prompted by the "bank holiday" and was the first step in Roosevelt's "first hundred days" of the New Deal. The Act was drafted in large part by officials appointed by the Hoover administration. The bill provided for the Treasury Department to initiate reserve requirements and a federal bailout to large failing institutions. It also removed the United States from the Gold Standard. All banks had to undergo a federal inspection to deem if they were stable enough to re-open. Within a week 1/3 of the banks re-opened in the United States and faith was, in large part, restored in the banking system. The act had few opponents, only taking fire from the farthest left elements of Congress who wanted to nationalize banks altogether. March 10, 1933: The Economy Act of 1933. Roosevelt, in sending this act to Congress, warned that if it did not pass, the country faced a billion dollar deficit. The act balanced the federal budget by cutting the salaries of government employees and cutting pensions to veterans by as much as 15 percent. It intended to reassure the deficit hawks that the new president was fiscally conservative. Although the act was heavily protested by left-leaning members of congress, it passed by an overwhelming margin. March 31, 1933: The Civilian Conservation Corps Reforestation Relief Act (ch. 17, 48 Stat. 22) established the Civilian Conservation Corps (CCC) as a means to combat unemployment and poverty. May 12, 1933: The Agricultural Adjustment Act (ch. 25, 48 Stat. 31) was part of a plan developed by Roosevelt's Secretary of Agriculture, Henry A. Wallace, and was designed to protect American farmers from the uncertainties of the depression through subsidies and production controls. The act laid the frame for long-term government control in the planning of the agricultural sector. In 1936 the act was ruled unconstitutional by the United States Supreme Court because it taxed one group to pay for another. May 12, 1933: The Federal Emergency Relief Act (ch. 30, 48 Stat. 55) established the Federal Emergency Relief Administration (FERA) which develop public works projects to give work to the unemployed. May 18, 1933: The Tennessee Valley Authority Act (ch. 32, 48 Stat. 58) created the Tennessee Valley Authority to relieve the Tennessee Valley by a series of public works projects. June 5, 1933: The Securities Act of 1933 (ch. 38, 48 Stat. 74) established the Securities Exchange Commission (SEC) as a way for the government to prevent a repeat of the Stock Market Crash of 1929. 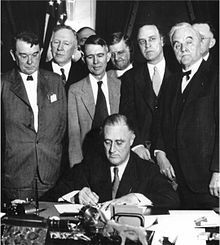 June 12, 1933: The Glass–Steagall Act of 1933 (ch. 89, 48 Stat. 162) was a follow up to the Glass–Steagall Act of 1932. Both acts sought to make banking safer and less prone to speculation. The 1933 act, however, established the Federal Deposit Insurance Corporation. June 16, 1933: The National Industrial Recovery Act ("NIRA", ch. 90, 48 Stat. 195) was an anti-deflation scheme promoted by the Chamber of Commerce that reversed anti-trust laws and permit trade associations to cooperate in stabilizing prices within their industries while making businesses ensure that the incomes of workers would rise along with their prices. It guaranteed to workers of the right of collective bargaining and helped spur major union organizing drives in major industries. In case consumer buying power lagged behind, thereby defeating the administration's initiatives, the NIRA created the Public Works Administration (PWA), a major program of public works spending designed to alleviate unemployment, and moreover to transfer funds to certain beneficiaries. The NIRA established the most important, but ultimately least successful provision: a new federal agency known as the National Recovery Administration (NRA), which attempted to stabilize prices and wages through cooperative "code authorities" involving government, business, and labor. The NIRA was seen hailed as a miracle, responding to the needs of labor, business, unemployment, and the deflation crisis. The "sick chicken case" led to the Supreme Court invalidating NIRA in 1935. March 24, 1934: The Tydings–McDuffie Act (Pub.L. 73–127, 48 Stat. 456) provided for self-government for the Commonwealth of the Philippines and a pathway to independence. June 6, 1934: The Securities Exchange Act of 1934 (ch. 404, 48 Stat. 881) grew out of the Securities Act of 1933 and regulated participation in financial markets. June 6, 1934: The National Firearms Act of 1934 (ch. 757, 48 Stat. 1236) regulated machine guns, short-barreled rifles and shotguns. The Senate Munitions Committee came into existence solely for the purpose of this hearing. Although World War I had been over for sixteen years, there were revived reports that America's leading munition companies had effectively influenced the United States into that conflict, which killed 53,000 Americans, hence the companies' nickname "Merchants of Death." The Democratic Party, controlling the Senate for the first time since the first world war, used the hype of these reports to organize the hearing in hopes of nationalizing America's munitions industry. The Democrats chose a Republican renowned for his ardent isolationist policies, Senator Gerald P. Nye of North Dakota, to head the hearing. Nye was typical of western agrarian progressives, and adamantly opposed America's involvement in any foreign war. Nye declared at the opening of the hearing "when the Senate investigation is over, we shall see that war and preparation for war is not a matter of national honor and national defense, but a matter of profit for the few." Over the next eighteen months, the "Nye Committee" (as newspapers called it) held ninety-three hearings, questioning more than two hundred witnesses, including J.P. Morgan, Jr. and Pierre du Pont. Committee members found little hard evidence of an active conspiracy among arms makers, yet the panel's reports did little to weaken the popular prejudice against "greedy munitions interests." The hearings overlapped the 73rd and 74th Congresses. They only came to an end after Chairman Nye provoked the Democratic caucus into cutting off funding. Nye, in the last hearing the Committee held in early 1936, attacked former Democratic President Woodrow Wilson, suggesting that Wilson had withheld essential information from Congress as it considered a declaration of war. Democratic leaders, including Appropriations Committee Chairman Carter Glass of Virginia, unleashed a furious response against Nye for "dirtdaubing the sepulcher of Woodrow Wilson." Standing before cheering colleagues in a packed Senate chamber, Glass slammed his fist onto his desk in protest until blood dripped from his knuckles, effectively prompting the Democratic caucus to withhold all funding for further hearings. Although the "Nye Committee" failed to achieve its goal of nationalizing the arms industry, it inspired three congressional neutrality acts in the mid-1930s that signaled profound American opposition to overseas involvement. For details, see Changes in membership, below. There were 48 states with two Senators per state, this gave the Senate 96 seats. Membership changed with four deaths, one resignation, and two appointees who were replaced by electees. Membership changed with twelve deaths and three resignations. Senators are popularly elected statewide every two years, with one-third beginning new six-year terms with each Congress. Preceding the names in the list below are Senate class numbers, which indicate the cycle of their election, In this Congress, Class 1 meant their term ended with this Congress, requiring reelection in 1934; Class 2 meant their term began in the last Congress, requiring reelection in 1936; and Class 3 meant their term began in this Congress, requiring reelection in 1938. Nebraska Robert Howell (R) Died March 11, 1933. New Mexico Sam Bratton (D) Resigned June 24, 1933, when appointed Judge of the U.S. Court of Appeals. Vermont Porter Dale (R) Died October 6, 1933. Wyoming John Kendrick (D) Died November 3, 1933. House of Representatives Session Calendar for the 73rd Congress (PDF). Official Congressional Directory for the 73rd Congress, 1st Session. Official Congressional Directory for the 73rd Congress, 1st Session - Supplemental. Official Congressional Directory for the 73rd Congress, 2nd Session. Official Congressional Directory for the 73rd Congress, 2nd Session (Revision).